-Integral full wood backing allows for ideal grab bar installation. -Self-supporting pre-leveled bottom eliminates mud setting. 4 piece shower with 4" smooth tile finish, 1/2" threshold, integral wall shelves, and center drain. 3 piece corner unit with 8" smooth tile finish, built in caddy, beveled 3/4" threshold and center drain. 4 piece shower with 4" smooth tile wall finish, 1/2" threshold, integral wall shelves and center drain. 4 piece shower with 4" smooth tile wall finish, beveled 1/2" threshold, integral wall shelves and center drain. 5 piece shower with diamond tile wall finish, 1-3/4" threshold, integral shelves, and end drain. 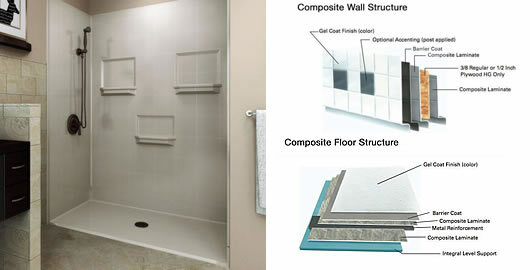 5 piece shower with 4" smooth tile wall finish, 1-3/4" threshold, integral wall shelves and end drain. 5 piece shower with diamond tile wall finish, 1-3/4" threshold, integral shelves and end drain. 5 piece shower with diamond tile wall finish, flat back panel wall, beveled 3/4" threshold and end drain. 5 piece shower with 4" smooth tile wall finish, beveled 3/4" threshold, integral wall shelves, and center drain.